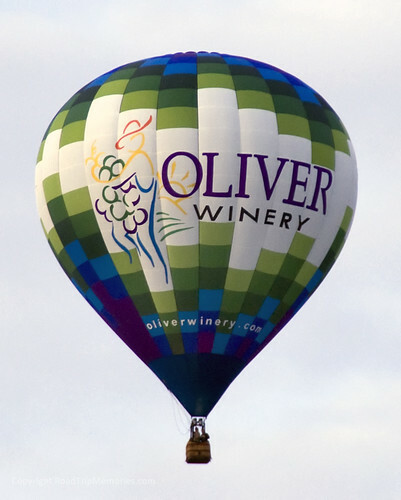 On Friday and Saturday evenings, hot-air balloon pilots would be participating in a “balloon glow,” where they would illuminate their balloons in different patterns: synchronized, sequential, twinkles, etc. I had seen photos on Flickr taken by the IndyFlickr group at a similar event at the Indiana State Fair grounds, and it looked very cool. 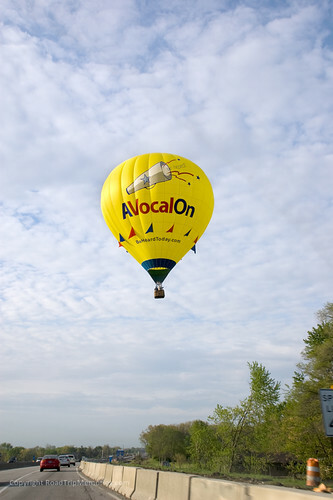 The next events were held Saturday morning, a “Founding Fathers” balloon race, and the annual 500 Festival Mini-Marathon. Pat asked me about making our annual trek down to the intersection of Georgetown, 16th & Crawfordsville Roads to watch the marathon participants arrive. It’s always a spectacular sight to see 35,000 people running by! But unfortunately, again I wasn’t up to it. My lower left side was swollen and hurt badly. I had taken Lodine and Vicodin, neither of which was helping, and I was tired from lack of sleep and food for the past week. A call to the “on-call” dentist was frustrating, as he was participating in the Mini! He asked if I needed a prescription for Vicodin called in and I explained that I had some, but that it wasn’t helping, which is why I was calling! He suggested I had a dry socket, and to take the Vicodin, and come in on Monday. Not wanting to mess up his marathon pace, I told him I’d call Monday and hung up. So, I again attempted to try Vicodin, and it helped make me groggy, but didn’t touch the pain. Then, for some unknown but happily miraculous reason, later in the afternoon, the pain went away on its own and I was *completely* pain free! It felt as if nothing was done! 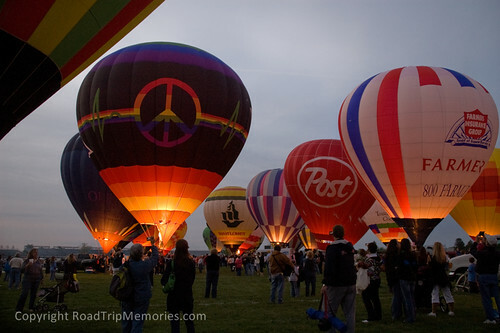 So, by 7:30, I decided to head over to the track for tonight’s balloon glow. Pat was busy working on Amber’s car, but was finishing up and would join me shortly. So I grabbed my Nikon D50, hopped in the Corolla, and made the long, arduous drive over there. Usually not long or arduous, as I live 1/2 mile away, but there was pretty good traffic heading in there. I was directed to park behind the Hall of Fame Museum and made my way over to the field where the balloons were lined up. 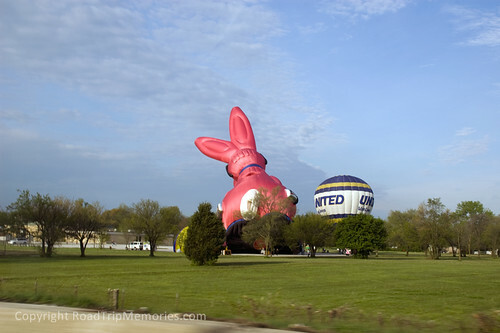 There was a wicked HUGE Energizer Bunny there, 166 feet tall! The remainder of my pain free evening had continued until I went to sleep around midnight, and I managed to get 6 hours’ sleep, the most consecutive sleep I’d had since the surgery. Unfortunately, I woke up in worse pain than ever! I took a Lodine, which took the edge off for a few hours. That gave Pat and me enough chance to head to the track for the “100 Years Race.” The traffic was much easier to handle this morning! 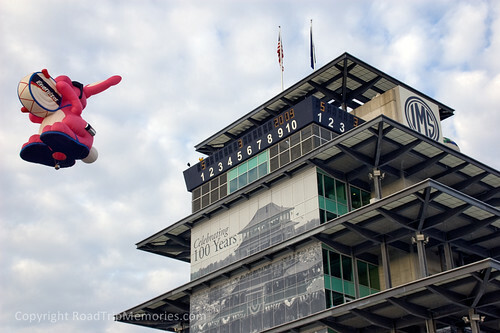 It’s not every day a 166-foot pink bunny flies past the Bombardier Pagoda at the Indianapolis Motor Speedway! The Energizer Bunny was there too, losing some of his energy as he deflated.